Lisa and I met about 13 years ago, although we did not start dating until 2011. She runs a karate studio, and I teach in an elementary school. She often visits schools in the community to speak with the students about respect, self-discipline, and motivation. Back in 2003 – the year her studio opened, and my very first year teaching – she visited my classroom. We were at different places in our lives. I was newly married, and she was in a relationship. I was married to a man; she was with a woman. The time was not right, but I never forgot her face. Fast forward to 2010… I was recently divorced and had two small sons, and she was coming out of a relationship. My elder son wanted to take karate, and I remembered Lisa. I took my boys to her karate studio and reminded her that we had met before. We began spending some time together as friends. We saw movies and had lunches, but we weren’t interested in dating since I didn’t realise I could be interested in a woman. As we spent more time together, we accidentally fell in love with one another and the time we spent together was just so amazing. It wasn’t long before we became a couple. Lisa proposed to me at Walt Disney World in front of Cinderella’s castle, immediately after the nightly fireworks show in June 2014. She got down on her knee and told me how she had waited her whole life to find me, and that she wanted to be able to spend the rest of her life with me. I, of course, said yes. We cried. 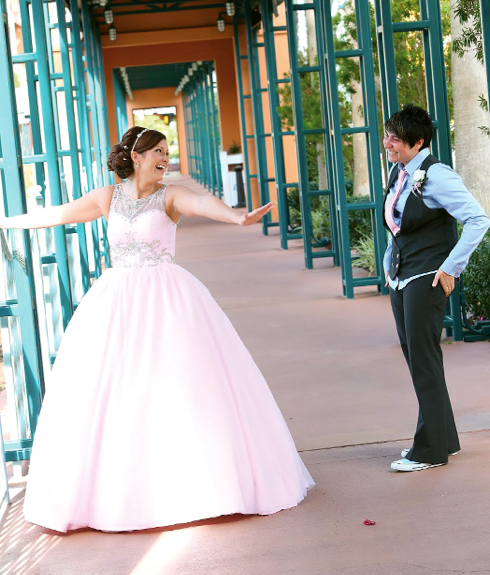 But I didn’t truly know if we would ever be able to be legally married. On 26 June 2015, we woke up to find that we could get married, FOR REAL! We were so thrilled. That was actually the first day that I felt truly engaged to Lisa. We had been engaged for a full year, but on that day I was actually engaged to be legally married to the love of my life. She knows I love Disney and it was where we’d got engaged. So she said, ‘Let’s get married there!’ We started the plans immediately, and set the date for 28 December 2015 – just in time to file our taxes together! We were married at The Swan and Dolphin Resort at Walt Disney World – on their sandy beach, with about 30 of our family and friends. We didn’t necessarily have a theme in mind, but as the plans progressed, we realised that our style was ‘pink and blue’, with hidden Mickeys throughout. She had Mickey cuff links, I had Mickeys in my hair and on my dress, and the boys had Mickey tie tacks. 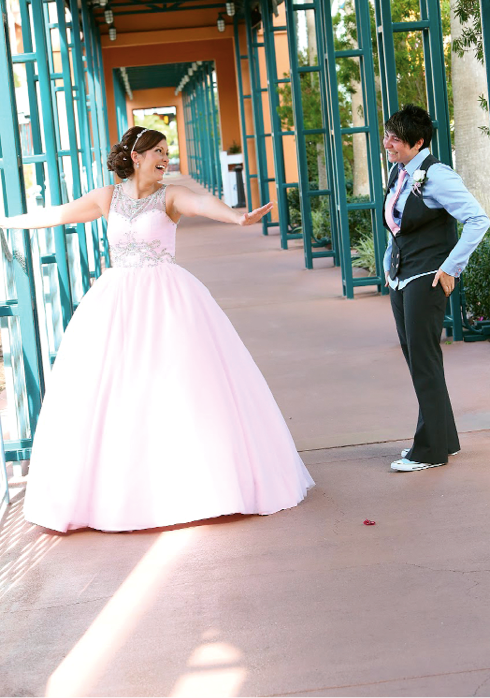 The guests received Mickey and Minnie ears as their favours, and bubbles were blown as we walked down the aisle. 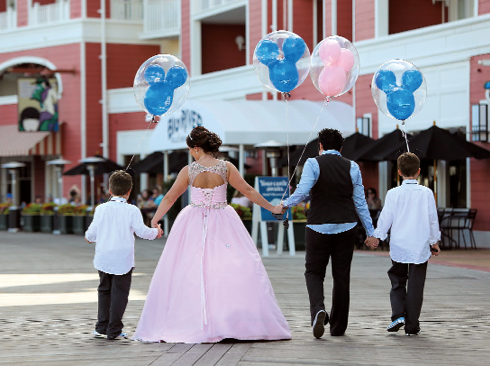 The guest book was filled with wooden Mickey heads, which were painted pink and blue and signed by each of our guests.